. 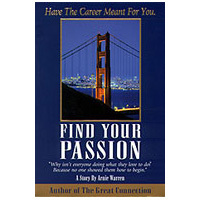 . . gives you a 1-2-3 method of finding your gifts that link to your passion and guide you to a career choice. Why, in a free society, isn’t everyone doing what he or she loves to do? It’s because they don’t know how to begin. Find Your Passion is the story of a man challenged by his fiancée to find a career he’ll be passionate about. “You cannot live—really live—without a passion for your work.” In his search, he is told he must first find his gifts before a career match can be made. The author consulted with Dr. Edith Donohue whose doctoral thesis focused on this process. Her well-researched and practiced method is incorporated in this fast-moving story. Find Your Passion is for those seeking to have the career they were meant to have.